Join us for our very special, debut ‘season launch event’ with LIVE PERFORMANCES from local soloists, Miriam Lawton and Martin Bradbury, plus special guests - and maybe a few surprises! Everyone involved in performing and producing this evening's 'Last Night of the Proms' show is very kindly donating their services to raise funds to buy essential equipment for the Millgate Arts Centre. Doors open at 6.30pm with a glass of Champagne on arrival. 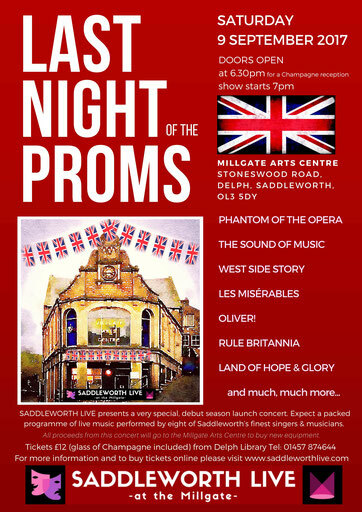 Expect a packed programme of live music featuring beautiful songs from your favourite BROADWAY and WEST END shows including LES MISERABLES, WEST SIDE STORY, OLIVER!, PHANTOM OF THE OPERA,THE SOUND OF MUSIC and much, much more - performed by eight of Saddleworth’s finest, talented singers and musicians. We will round the evening off in suitably rousing style by joining in with the revellers at the Royal Albert Hall for traditional flag-waving fun and sing-a-longs with the BBC’s Last Night of the Proms finále on the big screen (Land of Hope and Glory, Rule Britannia etc.). 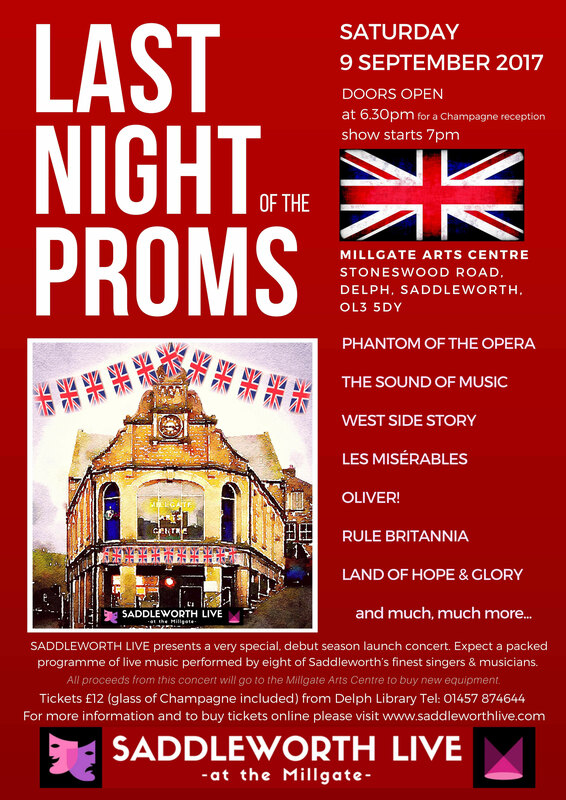 These Last Night at the Proms concerts have proven to be firm favourites with Saddleworth audiences over the last five years and we are looking forward to 'transferring' to the Millgate theatre. Its large stage and auditorium means that Miriam and Martin are able to bring more performers on board and we are very grateful to them for their support and we can't wait to welcome you to what promises to be a fabulous evening - a fitting start to our debut season at the Millgate! Programme devised and directed by Miriam Lawton and Martin Bradbury.